THE WARNING, the Monterrey, Mexico-based band made up of three young sisters, performed its cover version of OZZY OSBOURNE's "Crazy Train" on the April 24 episode of "The Ellen DeGeneres Show". Check out video footage of their appearance below. 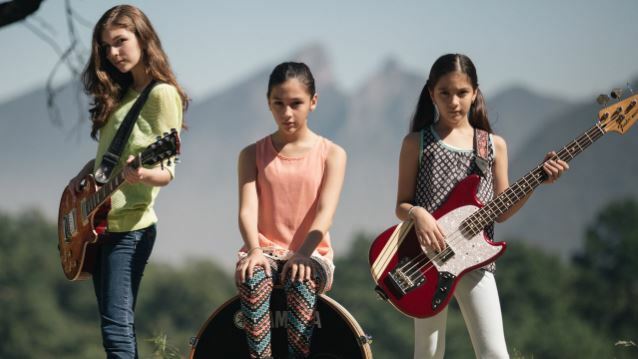 The trio, which includes 16-year-old Dany on lead vocals and plays guitar, 13-year-old Paulina on drums and 10-year-old Alejandra on bass, was invited to perform on the show after getting attention for their cover videos on YouTube of both classic rock songs and newer pop hits. THE WARNING recently signed a deal with Victoria Records and released a debut EP of original songs, "Escape The Mind", via iTunes. Victoria Morales-Kuhne, the owner and talent manager of Victoria Records, told Mic.com that she was blown away when she watched THE WARNING perform live. "I attended the show, sat on the front row and got chills the entire time," she said. "Their original music was incredible, everything I could ever hope for and more... I knew this was one of those once-in-a-lifetime moments when you're witnessing music history and music greatness, and if you're lucky in this industry, you run into one artist like THE WARNING once in your lifetime." THE WARNING will use the proceeds from record sales, as well as additional funds from a GoFundMe crowdfunding campaign, to cover their tuition fees for a summer program at the renowned Berklee College of Music in Massachusetts. Ellen DeGeneres also wanted to help the sisters on their musical journey so she gave each of the girls a check for $10,000 courtesy of Target.